Gimuy Yidinydji representative Seith Fourmile, along with Mayor Val Schier and Councillor Diane Forsyth of Cairns Regional Council, launched Bama County today to mark the beginning of NAIDOC week in the region. 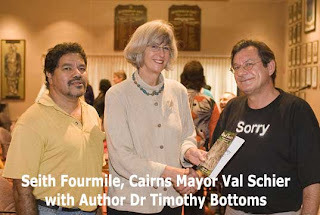 The book was written by local Cairns Historian Dr Tim Bottoms. In launching NAIDOC week, Mayor Schier said that the previous Cairns Council didn't have a good relationship with the local indigenous community. "We need to move forward and work with these people," she said. Aboriginal leader Terry O’Shane made glowing reference to Dr Bottoms' work over the last 20 years. "Tim consulted with local Aboriginal people to verify his research," said O'Shane. "He has shown great empathy to Indigenous people and their traditional lifestyle." Rob Hinxman, who taught at Yarrabah for 20 years, was also acknowledged for his support in sharing knowledge for the publication. "I also thank those Bama present and the ‘Old People’ who are with us in spirit, as well as the Gimuy Yidinydji, whose country we are on today, " Dr Bottoms said at the launch. Bama Country is a small book, however that belies how difficult it was to write and and how essential and interesting is the subject matter, Dr Bottoms says. "To cover such a large area, now referred to as the Wet Tropics; from Cooktown in the north, to Ingham in the south, to 100 kms inland, and some four major language groups, each with many dialects and cultural differences, posed some serious challenges," Tim Bottoms said at the launch today. "Although each of the clan groups that comprised the language and broader linguistic groupings shared many aspects in common, there were differences. These were significant dialectic and cultural variations, within and between language groups." "These subtleties could not be ignored, but could not fully be elaborated upon. This work is, in a sense, a distillation of some 20 years of research and writing, and most importantly, of meeting and mixing with descendants of the original Bama." "Their experience and that of their grandparents and great grandparents is a story that I have in part told in Djabugay Country, and hope to tell in a future publication Yidinydji Bulmba," Dr Bottoms says. Dr Bottoms says that the Bama have an extremely old and enduring cultural heritage which when one attempts to understand, brings into focus a land that has had continuous human occupation for thousands of years; more so than Europe or North America. "It is my fervent hope that Bama Country will give an insight into the fascinating and irreplaceable world of our original inhabitants and pride in their unique achievements.